Human anti maltose binding protein antibody, clone AbD06592 recognizes maltose binding protein (MBP). MBP is a periplasmic protein of Escherichia.coli (Guillermo et al. 2010), involved in the chemotactic response to maltose (Manson et al. 1985). MBP is commonly used as a carrier protein for the production of stable fusion proteins, which facilitates the identification and purification of the protein (Lebendiker et al. 2011). Human anti maltose binding protein antibody, clone AbD06592 is useful in recognizing proteins expressed with an MBP tag. A bivalent human recombinant Fab selected from the HuCAL® GOLD phage display library, expressed in E. coli. This Fab fragment is dimerized via a helix-turn-helix motif. The antibody is tagged with a myc-tag (EQKLISEEDL) and a his-tag (HHHHHH) at the C-terminus of the antibody heavy chain. This antibody is supplied as a liquid conjugated to DyLight®549. A bivalent human recombinant Fab selected from the HuCAL® GOLD phage display library, expressed in E. coli. This Fab fragment is dimerized via a helix-turn-helix motif. The antibody is tagged with a myc-tag (EQKLISEEDL) and a his-tag (HHHHHH) at the C-terminus of the antibody heavy chain. This antibody is supplied as a liquid. 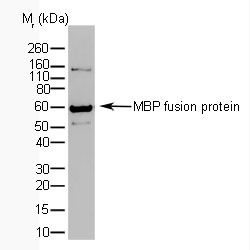 Fusion protein containing MBP as the fusion partner. View more products with "MALTOSE BINDING PROTEIN" specificity.